I've been tagged by the Mad Aunt to share seven random things about myself. 1. I am NOT a morning person. 2. 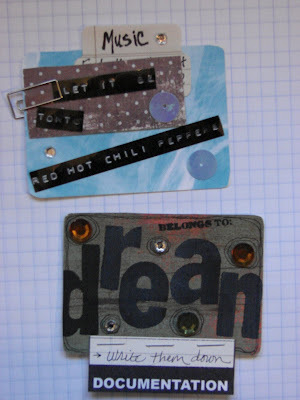 Sometimes I dream about scrapbooking, (Ethan assures me this is fine, as he dreams of writing his novel!). 3. I LOVE small town living! 4. When pregnant, brushing my teeth made me gag! 5. Sometimes I leave the driver's seat in the car moved up on purpose after driving, (Ethan's tall...long legs...can't stand it when I leave the seat moved forward!). 6. I really, really, really miss my Dad and want him to come and visit soon! 7. I absolutely love being Zoey's mama! Okay, now I am tagging Aaron, Robin & Chad, (counting this as two! ), Cherity, Diane, Anne and Esther! spent outdoors. 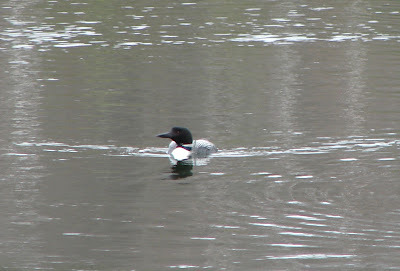 We saw two loon really close up, other than that we heard some woodpeckers and saw some squirrels, but that was about it for wildlife this time around. Had a quiet afternoon at home, I got some cards made and finished up a layout that I want to submit for publishing, Zoey and I played trains and did some watercolor painting and then it was time for Papa to come home. To add to the excitement of a very full day, we ended it with our first Hoggie Doggie's ice cream treat of the season. was had here....Saturday I worked my first shift at the scrapbook store and I loooooved it! :) They have a TON of brand new product, they painted the store and rearranged and it looks fabulous and makes me all the more excited to be working there! I made displays by winding up brightly colored and patterned ribbons by the yard and placing them in huge glass jars and scattering them all over the store. 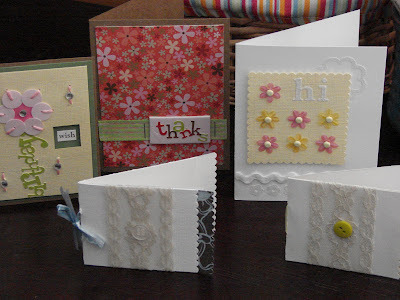 I met some ladies that come in regularly to craft and use the classroom and tools, and got to know the staff a bit better, everyone was very welcoming...made me feel very good about my making the decision to work there. Then on Sunday Zoey sang at church! We have been a bit nervous about this as we didn't even think that she would walk up to the front of the church let alone sing, but for whatever reason yesterday she woke up, we got her ready, explaining exactly what was going to happen, (or what we were hoping would happen), and once we got to the church, Ethan went in to sit down and I waited out in the lobby with all the other little kids and moms and Zoey was saying, "Go..go..go..mama! "....once the doors opened to the church she marched right up to the front of the church and said, "start the music guys!" and she SANG and DANCED!!!! We were absolutely floored! In all the practice sessions she was the one that was quiet and looking worried and for the real deal she was one of the ONLY ones that sang, (and she sang LOUD! ), and she danced! At one point she turned around to face the cross that was standing behind her and she lifted up her arms and sang out to it...it was very dramatic and so cute! The lyrics of the song were, "Our God is so big, (arms up to the sky), so big and so strong, (arms make muscles) there is nothing our God cannot do, (all the kids shake their heads no),...oooo...oooo, (monkey grunts for the oooo...ooooo and arms imitate those of a monkey! ), the mountains are his, (make a point with the hands above head), the rivers are his, (wave hands like moving water), the stars are his handiwork too, (move fingers above head)", and then it repeats the first phrase. After the church service all the elderly couples came up to Zoey to congratulate her on her job well done and thanked her for the morning entertainment! :) Made us so happy! After the church service and Zoey's big debut, we had our end of the year family picnic for MOP's along with an Easter Egg hunt for the kids. Really was nice to have all the husbands get to meet each other and all the other wives, as well as have them get to know the nursery care workers. The kids had a blast and we left the picnic with one sweaty, sticky and tired little girl. Once home, Ethan replaced the storm windows with the screen windows and did other putsy little things around the house and I rearranged and cleaned my craft area, (will try to share photos of this soon, as I really like how it turned out! 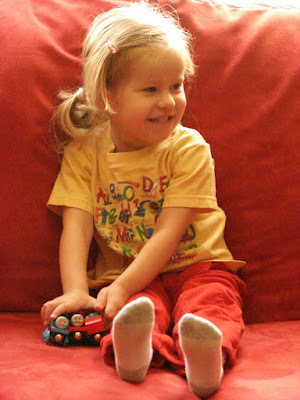 ), and Zoey played trains. All in all it made for a pleasantly full Sunday spent with family and friends. We all felt so good at the end of the day, tired but good! is now completed! I loooooved working on this SO much! 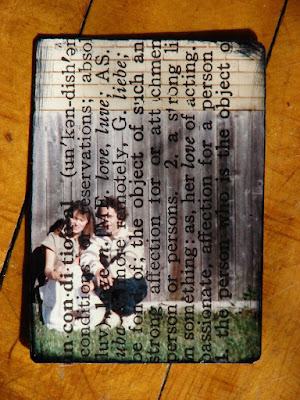 Such a cool concept of taking nothing and building it up layer by layer to create a very meaningful something. I do have to say though that there is a part of me that is glad that it is done...I think Ethan may be a bit relieved as well as the entire upstairs of our house has been a complete disaster with paints, brushes, bits of papers, bottles of adhesives, pieces of chipboard, pictures, etc., etc., for the past week or so! :) But, oh so worth it! If you would like to see the album in it's entirety you can view the finished product in detail by clicking here. So enjoyed this, the process and the project...thanks Ali! These are pictures taken of my cousin Scott at my and Ethan's wedding in 2003. Scott has always been my favorite cousin...he was always the "bad boy" of the family, always a bit of a rebel and a free spirit, was always in a band, whether it was a rock & roll band, a religious group or otherwise, he always has had a thing for good music and a wicked talent with the keyboard and guitar. I remember that whenever Scott would come to visit for a holiday I would get so excited before the visit and then when he would arrive I would act like I was totally cool with things, couldn't care less that he was around...but I did! Typical teenage behavior, I know! :) But, I soaked up every word and every conversation that he had! Even as an adult, when I found out that he was going to be able to make it to my wedding a part of me was extremely flattered and giddy with excitement...he's one of those individuals that carries a charisma about them and demands fun, goofiness and good times to be had by those around them. He is definitely one that knows the "how to" of keepin' it real. I've been thinking about him a lot lately as he has been having some health problems. And, while I can't be there to see him right now, I thought that this would be a neat way to connect with him and to perhaps have others send him some healing thoughts and/or prayers. Love you Scottie! takes lots and lots of concentration! 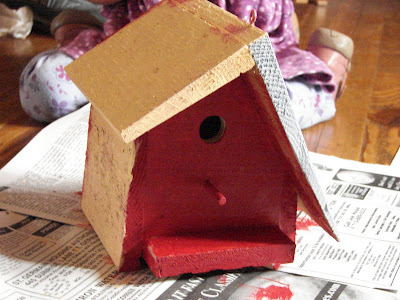 Can't quite believe just how intent Zoey was on getting her birdhouse just right! 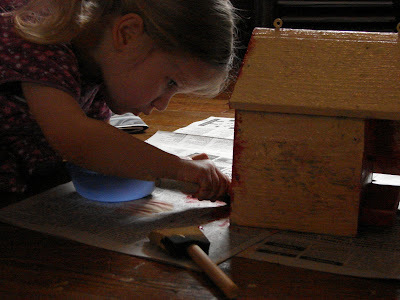 We went to MOP's this morning and each mom was given a birdhouse to take home for our kids to paint, (we are giving the completed birdhouses to the nursery care providers as a thank-you gift at the end of the semester picnic), and Zoey wanted to start working on hers as soon as we got home this afternoon. 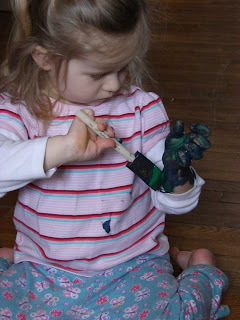 It was so fun to see the look of satisfaction on her face after completing her beautiful job of painting! Makes me wish that I could keep the birdhouse! 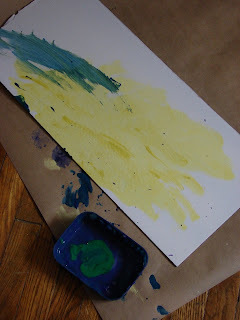 :) Other than MOP's and our painting project we didn't really do too much else beyond the usual errands and things...hoping that the weather cooperates tomorrow and we can get some playing in at the park perhaps. This week's prompt from Em was your parents. Easy for me this week...the word unconditional pretty much sums it up. My childhood was golden, magical, unbelievably special and boy did I feel loved. As a child I can say that I honestly felt that I may have been an angel in my parents eyes. My parents aren't together anymore, so it's a pretty neat thing that I am able to say that about my growing up days. I hardly have any pictures of my parents together, (maybe only five), so this was a pretty neat way to use one of them! This was taken of my parents in our backyard while we were living in Pepin, Wisconsin, my childhood hometown. Just adhered photo to card, used a rub-on from Creative Imaginations and inked the edges! that when I am being the most productive, (creatively speaking), is when Zoey is as well! :) I've been working on completing the evolution album, (taught by Ali Edwards at Artistry 2007), and am really enjoying the putting together of it, almost just as much as all the personal reflecting that it requires of one to do on the different phases and stages in ones life. I really want to get it finished so that I can share here, but at the same time it's something that I'm really loving working on right now and I want to get it just the way I want it, so I'm not rushing the process. This is new for me...I'm one to want the end result a.s.a.p., sometimes forsaking quality over the end result. 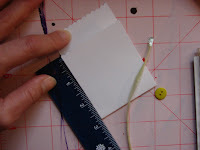 Learning that sometimes it takes time to make things work well, last, mean more is such a huge lesson, (for me), and I am beginning to apply it to my relationships, my daily actions, and my creative projects. 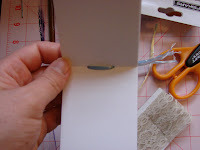 It's funny how something like making a simple card, creating a scrapbook layout, a small painting or creating a mini album or journal, (or creating a recipe, writing a poem, planting a flower, etc. ), can help us to learn something greater and more important about ourselves. This creating stuff is really, really, really a cool thing for so many people and in so many different ways. For me, the one thing I am loving about the creating of this evolution album is that you are essentially starting out with nothing...the act of having to paint each and every page of the album, (I've discovered that I LOVE this paint by the way!!! 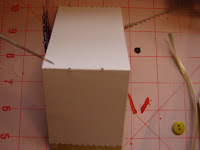 ), and the chipboard pieces and the having to assemble the pages, building it up layer by layer is so symbolic of life and living and I am just realizing that I want to take care in this process, to not be too hasty, enjoy, remember, learn and protect so that this album will last and so this life will endure. Will share with you when I am done! In my original post I included a link to this girl, because I wanted to show her version of Ali's evolution album...I removed it because I wasn't sure if it was appropriate of me to share someone else's personal story, but, after sleeping on it and checking her blog again this morning, I've come to the conclusion that it's a great thing to share and that it may empower someone else to use their voice to share something equally important and realize that there is power in numbers and that there is strength in the telling of the story and that growth can come of the sharing of it. My Goodies from Ali Have Arrived! A good afternoon here...this is what was delivered to my door this afternoon from Ali Edwards! I am so overwhelmed, (in a very good way! 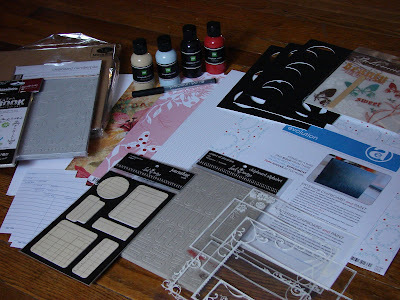 ), and so excited to start playing with all these goodies! :) The goods are as follows: a Maya Road journal, Basic Grey chipboard numbers, Heidi Swapp chipboard letters and journaling spots, Making Memories paint, acrylic clear frames from My Mind's Eye, index cards, Creative Imaginations rub-ons, My Mind's Eye Bohemian rub-ons, American Crafts pen, Basic Grey, American Crafts, Reminisce and Urban Lily paper, textured card stock, complete instructions for the album and more! THANK YOU so much Ali! 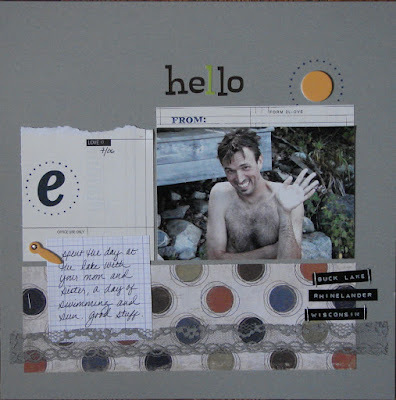 Picture for this layout was taken by my MIL this last summer while we were spending an afternoon swimming at Buck Lake in Rhinelander, Wisconsin. Looking forward to doing that again this summer with Zoey perhaps joining in on the fun. She's been a bit timid as far as going in the water is concerned, though to be fair, she did go in the water a couple of times last year. I often wonder things about others, (strangers and those that are familiar), as I am sure we all do, but recently I am finding that I have to mentally stop myself from asking things outright as they could potentially be taken as too personal or, quite frankly none of my business. I find myself wanting to know if people are happy, really happy. I wonder what is it that they and their loved ones do together at home and/or after their day of work is done? If I know them, I may wonder do they think of me, and if so, what do they think? Are they fulfilled in their relationships? Do they have the answer to the secret that is living life to the fullest? Are they listening to their dream? Have they held on to it? Have they ever come to know it? Are they paying attention to the time spent living their life each and every day or are they just going through the day, minutes ticked off and away and punched in to the time clock only to wake up to go on to the next? Do they think there is something more? Do they want something more? These are questions that I ask myself often and therefore in lies part of the reason that I am probably wondering what the answers would be from others. It strikes me as absurd sometimes how we so often feel the need for pretense, for protecting an image of togetherness, control, of having all the answers. Even when asking family or friends it seems there is a measured response, the need to be careful not to reveal too much or be left too exposed. I am the same way when met with inquiry, after all, I do not want to be seen as vulnerable or left too exposed either...just some things I am thinking about this morning. 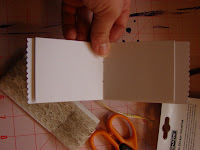 Start with a piece of plain white card stock cut to size, (2 1/2 in. x 6 1/2 in. 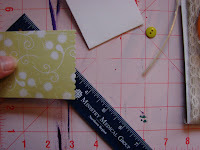 ), a piece of patterned paper cut to size, (2 1/2 in. x 3 1/4 in.). 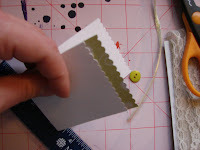 on both ends of white card stock strip to create a patterned edging. 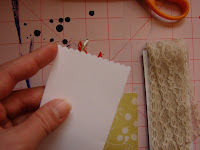 patterned paper and cut one side, (the side that you want visible), with scalloped scissors. 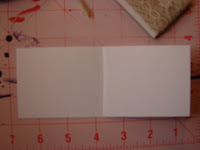 of white paper, (or card stock), to size, (2 1/2 in. x 6 in.) and fold in half. 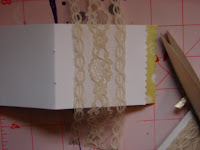 evenly spaced on the fold line of your card. 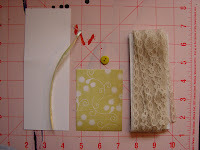 use adhesive to attach lace together. 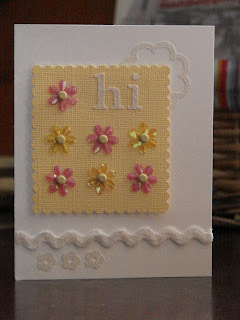 sweet and simple, yet classy little card! :) See previous post! I've been on a creative card streak here the last couple of days or so...liking the smallness of just focusing on one little card at a time and enjoying the process of it all. I'm pretty pleased with what I came up with and am wanting to make more! I think that part of it is that I am sick of seeing all the snow out my window so I'm feeling better making "Spring-like" little goodies! 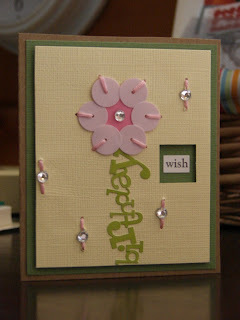 Also doesn't hurt that there is a Spring card challenge being held over at Creating Pages! :) Love that site! 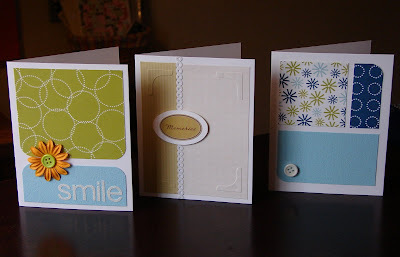 Anyways, thought I'd share my happy little cards! 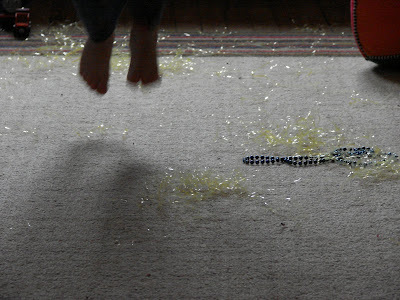 Easter grass is all over the house and Zoey is one very pleased little girl. Have a blessed day! So much to share it seems! This afternoon I went to my local scrapbook store and was introduced to the staff for the first time, as I will be joining them this summer working retail and teaching! :) SUPER exciting and it was fun meeting with the other ladies and getting a feel for the place, the classroom and familiarizing myself a bit more with the products they have, (didn't need too much help with that though, I think I knew what was where better than the owner just by my shopping there so frequently!!). The owner is already talking about and making suggestions on classes that I could do, and it sounds as though I'm going to have a lot of freedom to do what I want to do which really makes me happy, a bit nervous too, but it's a good nervous. Last Tuesday's MOP'S group was awesome. We had a sister come in from the Franciscan Center to speak to us and she was so insightful, such a peaceful spirit, and I really appreciated what she offered us as a group and as individuals. She started the session by passing around a basket of seeds, (vegetables, herbs and flowers), for everyone to choose from and after we all had our packets she talked about the picture on the front of each of our packet's and how it represented the goal, the end result that we equate with beauty and/or success. Then she asked all of us to turn our packet's over and we then discussed all the different requirements of the tending to the seed to get that end result...spacing, germination time, did we need sunny/partly sunny exposure?, when were we to be planted? - what was our season?, what was our height to be?, our depth needed?, things like that. And then she applied all of this to each of us as individuals, our children and our homes. Explaining how sometimes, no matter how well we follow the requirements or directions the end result may not look like that picture on the front of the seed packet. There are no guarantee's, we need to remember that we all are different, we all have different requirements, different things that need tending to, different spacial comforts, different needs that need to be met in very specific and individual ways. It was also interesting to share as a group what we all picked for our seeds. I was an eggplant! No height for me! But I grow deep, which I found interesting! 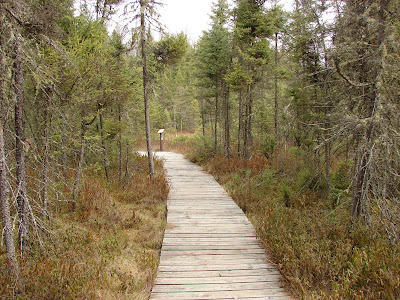 She also shared with us that the seeds of the Black Pine only open in the case of a fire, so in relating to us, she stated that sometimes the greatest growth occurs only when there is great tragedy. So needed to hear this and made me again realize how awesome it is that I've been invited into this group and reminded me how thankful I am for the opportunity to be living here in this community and that I get to call this place home. So much good is happening here for us. 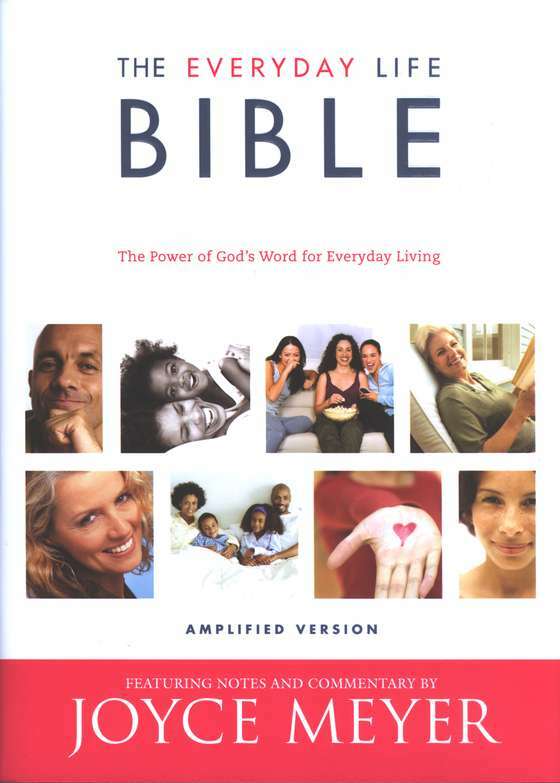 And, wanted to share that I recently purchased the Everyday Life Bible featuring notes and commentary by Joyce Meyer and am finding it to have been a very worthwhile purchase...it includes a book introduction which includes brief facts before the beginning of each book in the bible, life points which draw direct lines between the words of text and the experience of the reader, everyday life articles which focus on specific passages and feature Joyce's insight and teachings, and putting the word to work which offers questions to encourage introspection and then action for the reader to apply to their own life. I'm really finding this to be an accessible bible for me, I always found that I would get discouraged reading other versions as the text would be confusing or I wouldn't be able to easily grasp what the message was and would then just forget about it. Such a cool thing to be doing, reading the bible, and it gives me a moment to meditate on something other than what's going on immediately in front of me everyday...I'm able to see the bigger picture, (a version of it anyways), if that makes any sense. This week's prompt for the journal journey was: What's on Your Mind. Since my sister is visiting we both did cards for this week's challenge. A fun thing to do together. Hers is the one pictured on top and music is what's on her mind right now. Mine, pictured on the bottom is expressing my thoughts on taking the time to write down my dreams, and what an impact that can have. Also, found out today that a scrapbook layout that I submitted to Memory Makers is going to be published in their August/September issue! My first magazine publish! :) The issue, (Back to School issue), is being centered around education and role models so the page that will be featured in the magazine will be one I did of Ethan, (he's a teacher), working at school! Can't give out too much more, but I'm pretty excited! I found out yesterday that I won the contest over at Creating Pages! 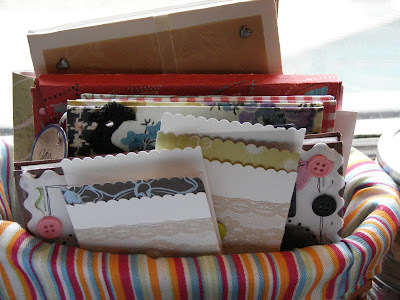 :) So exciting, I think that my prize is a gift certificate for the scrapbook shop online...yay! What an awesome couple of days it has been. With Ali getting the $ from Kevin Bacon for supporting the search and cure of autism, (such a cool thing), my getting chosen for her kit/class give away, my winning the scrapbook contest at Creating Pages, (an awesome community of scrappers by the way), and to top it all off I have family visiting this week, (my Mom and sister are here), it's been incredibly exciting! So I'm off now to have some fun with my family. Have a cheery Monday everyone!